William Jewell College students kicked off homecoming week Sept. 29 with Serve and Celebrate. The annual morning of service had 150 students serving at 14 different locations throughout Kansas City. The tradition started in the 1980s as a way to get Jewell students serving their community. Nonprofits served included Habitat ReStore, Harvesters, Hillcrest Hope, Inglewood Gardens, Garrison Center and Rebuilding Together KC. Students helped complete a variety of tasks, from planting trees to organizing stock in thrift stores. After serving, students ate lunch together in the cafeteria – those who didn’t have a meal plan had their meal paid for. The day also included prizes for best photos taken at the projects as an incentive for students to photograph their service. Jeff Buscher, college chaplain and service coordinator, organizes the annual event. He said he lets organizations know that Jewell students are willing to complete any task. “When I contact them, I tell them we don’t care what the project is. You’re busy serving the community and you don’t have time to paint that room, clean that closet, clean the yard, whatever it is let us help you do that,” Buscher said. Buscher adds that a willing and flexible attitude is key for all volunteers. Abigail Usrey, first-year history major, found that a flexible attitude was necessary when faced with her service opportunity. Usrey volunteered at Habitat ReStore, a donation center and home improvement store that generates revenue for Habitat for Humanity. 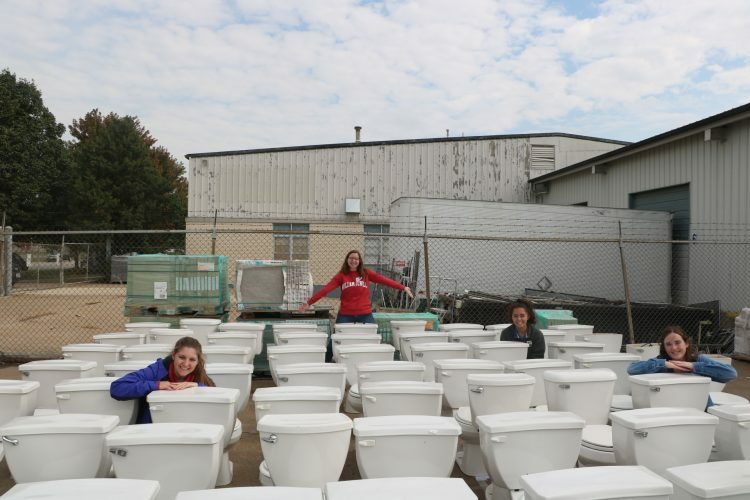 She and several other students dumped and carried 60 toilets that had been donated by an apartment complex. Abigail Usrey, Madison Carroll, Maddie McCormick and Savannah Hawley clean toilets at Habitat ReStore. “My favorite thing about serving was the comradery, because a couple of the people I hadn’t had the chance to hang out with and a couple of them I hadn’t met before, so we really bonded over cleaning toilets,” Usrey said of her experience. The comradery is a big benefit of Serve and Celebrate. Buscher purposefully creates service groups with people from a variety of different sports teams and organizations to give students a chance to get to know others and build community. RJ Daniels, first-year Oxbridge: Music major, volunteered at Hillcrest Hope. Hillcrest Hope provides transitional housing for those without homes. They spent the morning cleaning out an apartment for a family to move into. Daniels also feels that Serve and Celebrate is an excellent way for Jewell to get more involved in Kansas City. Buscher agrees that the service day casts a positive light on Jewell. “It gets Jewell’s name out there as a group of folks that are willing to roll up their sleeves and help these nonprofits that are doing great work across the city,” said Buscher. Every year organizations are extremely appreciative for the work that Jewell students put in. Buscher always gets multiple emails of thanks from the different nonprofits. Service has many benefits that are worth far more than the appreciation. Ursey believes people should take every opportunity they have to serve because there isn’t a good reason not to. Photos courtesy of Michaela Esau.